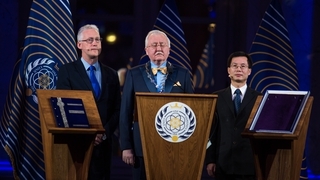 Asgardia’s first Head of Nation, Dr Igor Ashurbeyli, was inaugurated on the 25th of June at the Hofburg Palace with guests from over 40 countries from across the world. In attendance were ambassadors of more than 10 countries, representatives of a number of major public organizations affiliated with UN structures, newly elected Asgardian Members of Parliament, astronauts, space industry managers, scientists, international lawyers, and media from all over the world. Taking part in the ceremony was the Chairman of Parliament, Lembit Öpik, a former leader of the Welsh Assembly and Member of the British Parliament. The Head of the Supreme Court, Dr Yun Zhao, also took part—a well-known lawyer in the field of space law, a professor at Hong Kong University and a member of a number of arbitration courts. After taking his oath of office, Dr Ashurbeyli announced that, within the next 25 years, Asgardia will have habitable space stations and stationary settlements on the Moon equipped with artificial gravity and protection from cosmic radiation which will effectively enable permanent human habitation in space. In the coming months, he also announced that Asgardia’s first Government administration will be formed, during which time a Cabinet of Ministers will be appointed, alongside the formation of the Prosecutor General’s Office, the National Audit Office and the Supreme Space Council. Asgardia will also be establishing its National Bank and introducing its national cryptocurrency by the end of the year. Dr Ashurbeyli also shared his vision of Asgardia being ultimately populated by 2% of the world’s global population—150 million people. “By uniting in Asgardia, the progressive part of humanity can offer the whole civilization on Earth an alternative by replacing geopolitics with space politics and thereby open up a path to a new spiral of development,” he said.